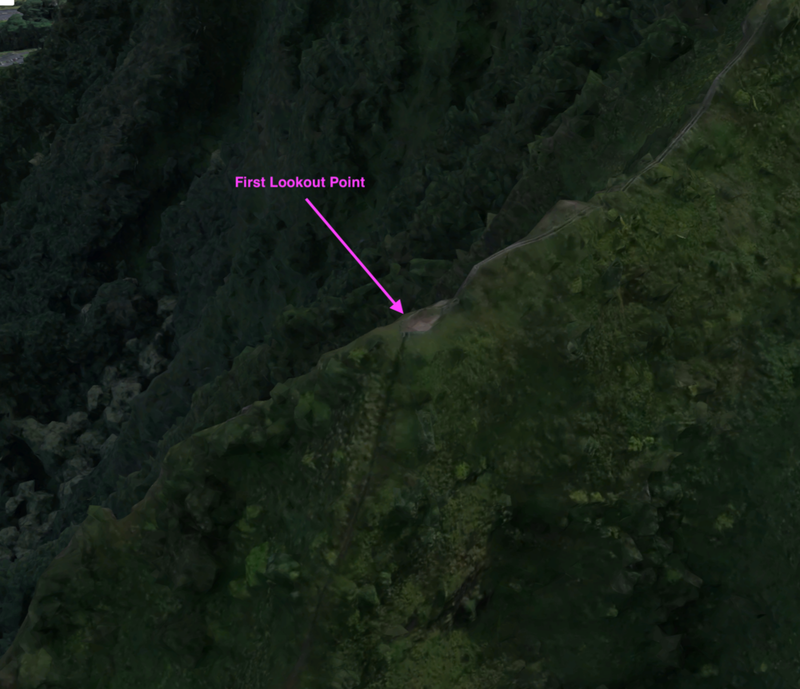 The following notes describe a hiker's experience accessing and hiking the Haiku Stairs via the Haiku Village neighborhood entrance on 6/1/2018. There are many blogs that describe this particular access point (and others) to the trail head. However, since this hike is illegal, it is difficult for aspiring hikers to predict whether particular entrances are still accessible, and at what level they are being monitored by authorities. I am providing the content below as a recent data point (as of June, 2018) for those interested in accessing the stairs via the Haiku Village neighborhood. As you must know, you assume some amount of risk by attempting this hike. I will make no attempt to quantify the consequences or probability of being caught (other bloggers try to do this; I have no idea if they're correct). Use the information below at your own discretion. 1) The guard is rumored to not be at his post before sunrise. I arrived at 5AM, just before sunrise; no guard was present. 2) The guard is known to ignore you on ascent. Why? Because local police understandably don't have the resources to pursue hikers up the stairs. Nor do they have the time to respond to calls only to wait 3-4 hours at the trail head for hikers to return once they've begun their ascent. Some hikers think it is prudent to choose a more discreet path during descent. After all, the descent portion of the hike is when you're perhaps more likely to be met by authorities. However, what some bloggers fail to realize is that the guard is going to see you during descent regardless of which of the aforementioned paths you take. According to this blog, the guard is rumored to be tasked with calling the police as soon as descenders pass the first lookout. All of the aforementioned trails pass this lookout, which is easily a 30 minute hike to the neighborhood (regardless of access point). Assuming this is true, it seems naive to think that responding police will only patrol the "access point 1" entrance. Rather, they will almost certainly sweep by all the neighborhood entrances. We opted to return via the same path we entered -- access point 1. This is a bit of a dice roll, but it worked out for us. For completion, I will also mention that there is a trail that leads down the opposite side of the mountain to a legal hiking path if you're really worried about avoiding law enforcement. However, this trail is described as being more technically difficult than the stairs and more dangerous, particularly if wet. Figure 0: Path from Haiku Village gated entrance to Trail Head via private road. Each segment described below. Google maps pin. Fig 1. Gated entrance to purple road. Google pin. Begin at the gated entrance accessible via the Haiku Village neighborhood. The gate may be closed and locked, as seen in this google maps image to the left. If so, a bypass is available through the (very thick and muddy) bamboo forest to the right. This can be difficult to navigate if you're arriving before sunrise -- the moonlight doesn't penetrate very far into the woods. A head lamp would be ideal but a cell phone flash light is sufficient in a pinch. Various bloggers have mentioned run-ins with angry neighbors. I arrived by Lyft around 4:30AM and didn't have any issues. If hiking at night, be courteous/quiet when walking through the neighborhood. Duh. This is pretty straight forward. After bypassing the gate (or walking through it, if open), walk down the open road for 5-10 minutes and take a left at the first fork, proceeding towards the highway. As indicated by the pin dropped in Figure 0, the private road will fork again — this time, the fork is not shown on google maps. Veer left at this fork towards the parking lot of the nearby building and look to your right for a fairly obvious and wide opening/entrance into the wooded area (green dashed line in Fig 0). It will be marked by a “no trespassing” sign. Don’t confuse this with the sign at the aforementioned fork! The unmarked fork has similar signage, but no obvious trail. Sadly, a good indicator that you’re heading in the right direction is the presence of trash strewn about in the woods. Fig 2. Quick jungle path to hole in fence that leads to guarded trail head. Green dashed line is approximate. Google maps pin. Upon entering the bamboo laden jungle, you may find the forest floor to be really slick/muddy. Tread carefully upwards (slight incline) and keep your eye on your phone's GPS. You should see quite a few broken bamboo plants that hikers have attempted to use to pull themselves up the trail. Make sure you’re heading roughly towards the red pin linked in the Fig 2 description. There are a couple false trails throughout the woods. So, when all else fails, use your GPS. I had great service in this area with Verizon, but you can download google maps ahead of time if you're worried about coverage. We slipped through the hole in the fence to arrive at an unattended guard post at approximately 5 AM on a Friday. There was no guard or vehicle present at this time so we continued excitedly towards segment 4. Once in the clearing, you'll see a porta-potty and possible the guard's vehicle. Some people chat with the guard, some just proceed towards the trail. You'll want to head straight towards the obvious opening in the woods indicated by the yellow dashed line in Figure 0. You will see some shallow wooden steps that lead towards the start of the metal staircase. At this point, you’ll meet another gated fence that can be bypassed by simply walking a few off the path. You can then return to the staircase and continue upwards towards the peak! Bring bug spray, ya' dingus. You're in the jungle. Bring a small towel and a spare change of clothes. Wiping down and changing prior to walking through the neighborhood will reduce suspicion from patrolling law enforcement. Some segments of the staircase are damaged or even missing. The bulk of the damage is found in the first 30 minutes of the hike (which is probably the most difficult portion). So, tread carefully during this segment! Especially when you're fatigued during descent. Make sure both of your hands are free for the duration of the climb. Don't bring anything that you have to carry. Some thoughtful hikers have painted various steps and railing segments blue. This is not arbitrary -- if you see any blue paint, avoid that step or railing as it is likely loose or damaged. If you have gloves to improve your grip, consider bringing them along. They'll be particularly help on the way down. This will also protect you from sharp edges or burrs on damaged portions of the hand rails, some of which are marked with blue tape. The staircase, various lookouts, and abandoned buildings along the way are all visible on google earth. I recommend checking this out prior to your hike. This helps to remove a lot of mystery regarding the trail head location and your proximity to the peak. First lookout. Affords beautiful views of the surrounding mountains/ocean and offers you an opportunity to catch your breath. Google maps pin. "Hoist House" and 2nd/3rd lookouts. Google maps pin. Final stretch to the peak. Google maps pin. Street view of staircase from highway. Google maps pin.